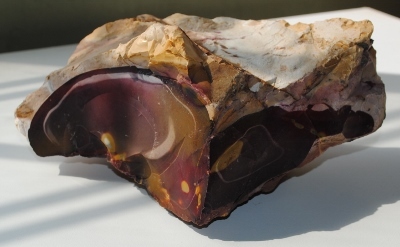 Stunning extra large dark mahogany red, tan, yellow, gray, purple-pink, and ivory white Mookaite Jasper Rough mineral specimen from Mooka Creek Carnarvon in Western Australia. Mookaite Jasper provides a useful balance between inner and outer experiences fostering a desire for new experiences with a calming present energy. Mookaite Jasper assists one with the “knowing” of the right decision or path to take. 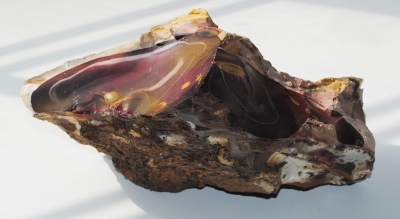 Mookaite Jasper resonates with the Earth’s electromagnetic energy currents and channels the vibration to maximize the effects of one’s will and personal power. Mookaite Jasper is helpful to those who would like to practice animal communication as this stone brings awareness to our instincts and animal “knowing.” Mookaite Jasper is supportive for those who are feeling lonely or are bereaved. Mookaite Jasper helps to slow physical aging processes by raising the vibration of one’s body and thoughts. Mookaite Jasper helps to identify one’s own beliefs about aging and helps to foster positive thoughts and a “young at heart” attitude about aging slow down the aging process. Mookaite Jasper helps one understand and release emotional and behavioral patterns that have been handed down from one’s family history. 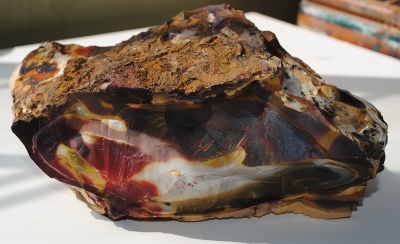 Mookaite Jasper is a physically stabilizing stone that fortifies the immune system, heals wounds and purifies the blood. 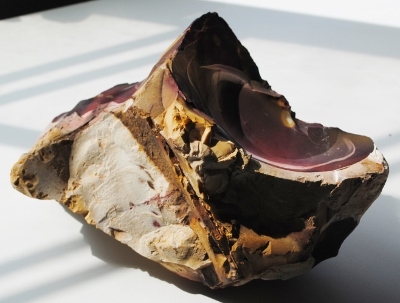 Mookaite Jasper supports reproduction, pregnancy, and the regeneration of the physical body.